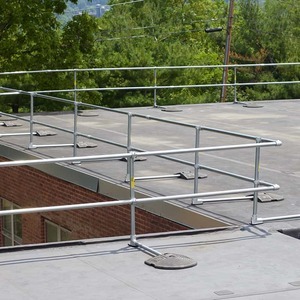 KeeGuard rooftop railing is an ideal choice for any low-slope or flat roof. KeeGuard is specifically engineered to protect your roof from potential leaks by using recycled PVC for the weighted bases. The rigidity of the guardrail will hold up to the strictest of requirements and last a lifetime. 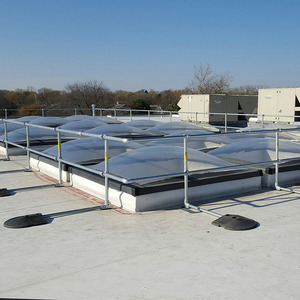 Non-Penetrating - Sits directly on your roof surface, eliminating penetrations. Modular System - Built to easily maneuver around units near an edge. 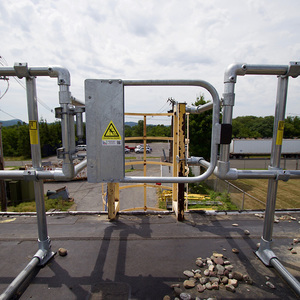 Adaptable - Clamp on to existing ladders or railing for complete access protection. Engineered Weights - Designed to spread out the weight to reduce stress on the roof. low-slope or flat roof types. 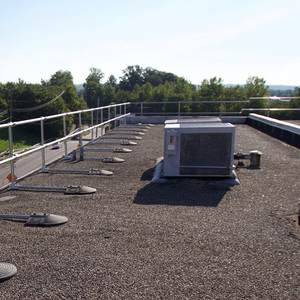 Flat roofs typically lack parapet walls, leaving an unprotected edge around the entire perimeter. 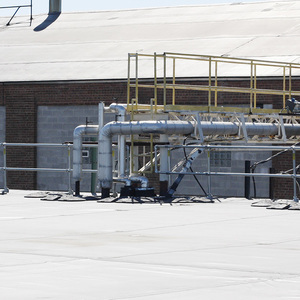 Low slope and flat roofs house a number of RTU's and other equipment. The location of these units can pose a risk by being near the edge. 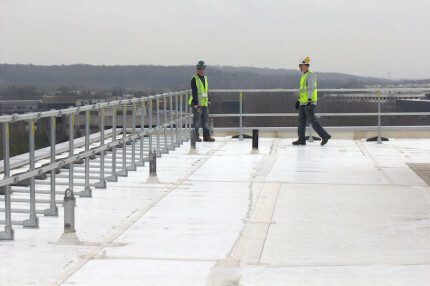 Walking to the work area on a flat roof can bring someone close to the edge. Anytime someone is within 15' from a fall hazard they are at risk. The most common way to access a flat roof is by either a fixed ladder or hatch. These are statistically the most hazardous place on the roof. 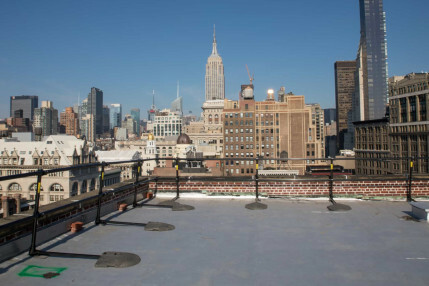 Skylights are common on flat roofs and prove to be a death trap for workers. OSHA even considers these to be holes in the roof. 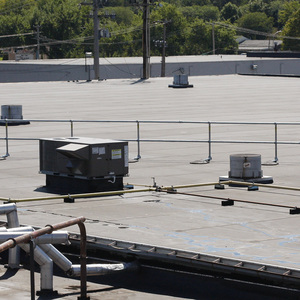 Many HVAC units are found on flat roofs near an edge. This forces maintenance workers to do their work next to a fall hazard. Most refrigeration lines require regular inspections. Unfortunately, most refrigeration lines are also installed near a roof edge. 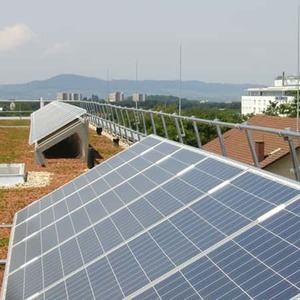 Flat roofs are a great surface for solar panel installations. 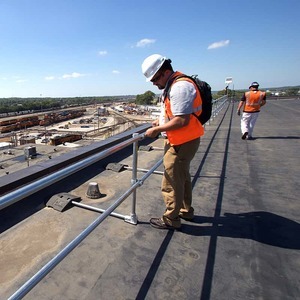 With that comes regular inspections and maintenance placing people at risk for a fall.